It’s Just So Many Words…. In December, I’ll be standing on stage singing songs in Greek, Turkish, and Bulgarian like I’ve known them all my life. Today, November 14, I’m staring down a really large pile of words in languages I don’t speak. 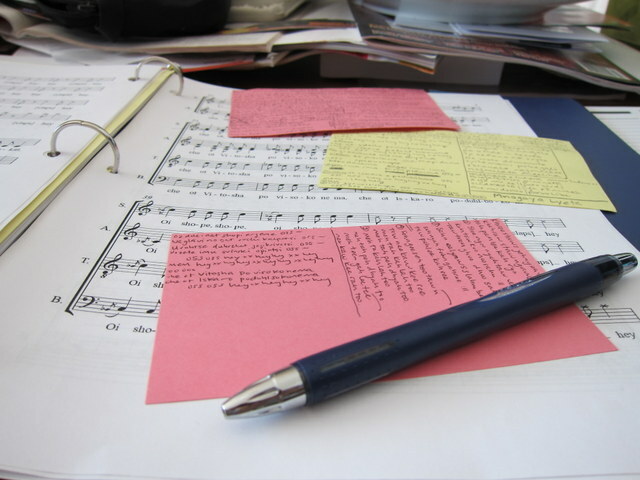 My memorization system has many parts. Some shorter pieces just stick in my head. But for most songs, it takes more work. First: index cards. 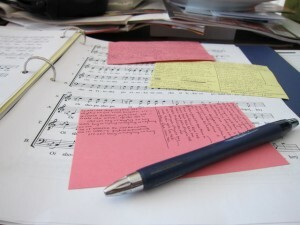 I write out the words, then carry the card around so I can study–and sing from it in rehearsal. Today’s project: My third card of the season. I think the card works mostly because the act of writing forces me to to pay attention. It wasn’t until I wrote out the Greek Christmas carol Saranda Meres this morning that I realized the second and third line are the same in most of the verses we’re singing. I’d sung it dozens of times without noticing. Yeah, my observational skills are amazing. Another part of the system is vivid mental images. This works better with songs in English; I got a couple of confusing lines of Carol of the Bells into my head by imagining them as little stories that were happening on stoops like the one in Sesame Street. For lyrics in a foreign language, I try to think of words in English that the words sound like, then string them into some kind of story. In my head, one of the particularly difficult songs in the 2011 Christmas Revels was about projectile vomiting in the desert. I recommend Moonwalking With Einstein, a fun book on memorization. It gave me good ideas for memorizing and confirmed what I’d noticed: it’s easier to remember things that you wouldn’t talk about in polite company.